As noted by TechCrunch, some users of Facebook's app for iOS have noticed the social network's new "App Center" tab showing up in the navigation menu within the app. The feature is designed as a one-stop destination for app discovery on a variety of platforms, with recommendations based on Facebook's editors' selections and personalized by drawing from the usage of each person's friends. 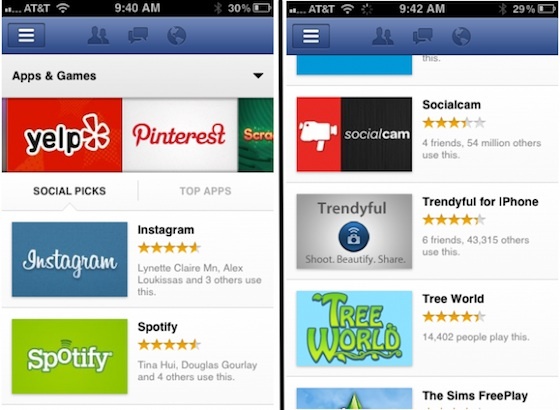 Within the app center, a "Social Picks" tab offers apps based on what the user's friends have used, while a "Top Apps" tab contains picks from Facebook's editors as determined by quality and popularity. The listings include iOS, Android, HTML5, and desktop apps, with users able to click directly through to the App Store or other marketplaces to download apps. The Next Web argues that the addition of App Center will be a major boost for Apple, helping quality apps to surface from among Facebook's hundreds of millions of users and those top apps to be easily accessible to other users. After several years of what has appeared to be a tenuous relationship between Apple and Facebook, it certainly appears that the two companies are now moving to work more closely together. At the D10 conference late last month, Apple CEO Tim Cook hinted at Facebook integration and perhaps other announcements in that vein, urging users to "stay tuned". Just a few days after Cook's comments, it was reported that Apple will indeed show off Facebook integration in iOS 6 at next week's Worldwide Developers Conference, making it much easier for users to post photos, status updates, and other content to the social network from within iOS. With Facebook also feeding back into the App Store through its own App Center on iOS, it certainly seems that the companies are moving quickly to solidify their relationship for their mutual benefit and to the benefit of the millions of users who rely on both Apple devices and Facebook's social network. Perhaps... just perhaps, and I know this is going out on a limb here, but what if, I dunno, I don't want to be inundated with notifications about what every other person I've ever met or heard of is doing at any given moment, and don't feel the need to broadcast my every move to everyone in the world? This self-promotion culture of do-nothing busybodies is crossing over from obnoxious to revolting. 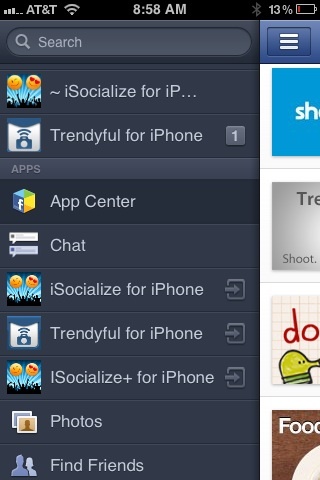 I really, really don't want Facebook as part of iOS. Not even happy Apple is going this route when it is just as easy to make it downloadable content. Please allow me to opt out in every way possible, or better yet delete any Facebook related components from my phone. No use for Facebook whatsoever. Am I the only one that absolutely hates apps within Facebook? I go as far typing in whatever I see in my feed into Google to bypass the crap like article links or that SocialCam thing. I don't care how well it is integrated, I'm not giving into the world of Facebook. My biggest gripe with apps for Facebook is that I have little clue as to what they are going to do with my account. For instance, marketplace app Oodle posts every little details of what I do on my timeline for everyone to see (e.g., items that I just viewed). And if I can collect $1 every time my Facebook friends post "I just achieved level 51 on Farmville or other embarrassing games", I'd be as rich as Mark Zuckerberg. I agree 100%, in fact, I can't for the life of me understand why Apple would "lend" their hard-earned platform to Facebook by giving them a spot baked Right into the OS. What's the upside for Apple? Is there anyone who has chosen to not purchase an iPhone because Facebook is not baked in? Will including Facebook at the OS level make anyone specifically chose the iPhone over another cell phone? As far as I can tell, the answer to both of these questions is no. Furthermore, without Apple's help to once and for all "legitimize" FB by adding it deep inside iOS, the FB fad would fade away at an even faster rate than it is presently. Wouldn't that be a good thing for Cupertino? Unless FB integration is a pay-to-play move from FB using their vast fortune of IPO funny money, what's in it for Apple?